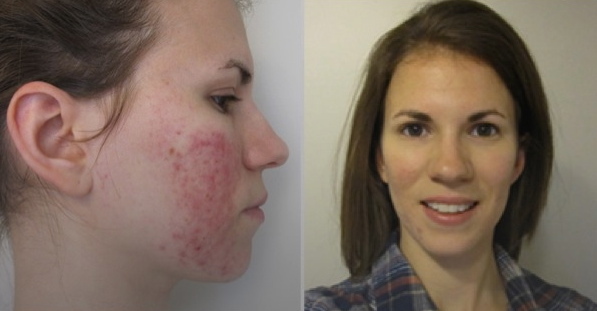 Rosacea is such a complex condition that not everyone’s skin will respond to a treatment plan in the same way. However, over 75% of clients who use Riversol MD experience noticeably visible improvement within the first 30 days. Dr.Rivers commitment is not just about selling skin products; rather, he believes that patients are best serviced by providing knowledge and tools to make rosacea an afterthought in their lives. What we appreciate in the Riversol® line is that Dr. Rivers believes in formulations that are simple with ingredients that have scientifically proven effective. All ingredients are carefully chosen to ensure optimal pH 5.0 as well, are anti-inflammatory and anti-bacterial. What patients appreciate most is that the home care regime is easyto follow. The powerful healing trio of the super-molecule beta-thujaplicin (which is derived from the Pacific Red Cedar Tree) along with stabilized vitamin C and vitamin E are combined with neutral and hypoallergenic base ingredients to address sensitivity while producing results. Laser treatments such as (IPL) are an option for treating Rosacea, and broken capillaries. Laser can also address tissue overgrowth associated with Rosacea. Combining laser with a suitable home regime may be discussed at time of consultation. Book Free Consultation and Receive FREE Trial size Rosacea Skin Care products!